How great would it be for everyone in your organization to be connected in real time? Try to imagine how much time can be saved if your office is able to enter new service tickets and have them instantly appear in your technicians' schedules. Now think about being able to do that even if you are out of the office! 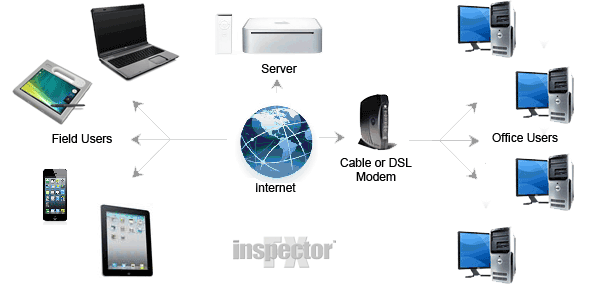 The InspectorFX Network Server allows you to run your business from the palm of your hand. The InspectorFX™ Server runs on a dedicated Mac Mini located in our partner’s data center allowing us to handle your technology while you handle your business. FileMaker Pro will be required for each PC or MAC that is connected to the server. iOS devices can connect to the server using FileMaker GO (Dedicated IP required for remote users). There is a one time $199 setup charge for each Mac or PC workstation plus a $29 monthly fee for each iOS device. This $29 fee includes Technical Support. See Technical Support for details. There is a $99 per year maintenance fee for each copy of FileMaker Pro. New Image offers a hosted solution called SmartPest Software goto smartpestsoftware.com for information on the hosted solution.